Nitrites & nitrates too high??? I have a 20 gallon, started in late November, with 12 glo danios and two small (less than 3cm each) plecos. All along it has been my "perfect" tank, crystal clear, no problems with fish or anything else that I was aware of. It is heated to 79 degrees (f), has a HOB bio filter for 20 - 55 gal tanks, has two bubblers and also has a 5 watt UV light. I do 30 - 40% water changes weekly, have well water, slightly hard. I have been testing with the 5 in 1 strips and things looked good, no nitrites, very, very slight nitrates, everything else where it should be according to the strips. Suddenly, this week's test showed nitrites off the chart and nitrates about 40. Repeat testing didn't change so it wasn't a bad strip. I dumped in a bottle of tetra safe start, supposed to lower nitrites AND nitrates, amount for about 15 gallons which was all I had on hand, no change at all 24 hours later. I am NOT overfeeding, in fact, I wonder if I am feed them enough. I also switched filters going to a bigger one a few weeks back. I also treated the tank with two doses of Malachite green and formalin as a precaution because of a severe outbreak of ich in another identical tank housing 15 glo tetras and also two tiny plecos about three weeks ago. Those fish recovered with only one loss, and that tank tests ideal with no nitrites, slight nitrates. I just ordered the API test kit with the vials since I hear that strips are not really accurate but it won't be here until Monday. What in the world is going on here and should I be worried???? Re: Nitrites & nitrates too high??? First that change to the larger filter is probably the cause, Along with the medicinal dosing. It probably broke your cycle causing a mini cycle to occur in your tank. Best course of action is lots of frequent water changes until your nitrite levels decrease to nothing. I wondered about that with the cycle. Tonight the nitrates are back down to 20 ppm but the nitrites are still off the end of the color chart. That is even MORE confusing to me, does this mean it is sort of working??? Where are all these nitrites coming from with that few fish??? I can't measure ammonia (yet), but the kh is ideal and the ph is neutral, but gh is very hard, at 300. Okay, off to do another water change!!! When I did the last water change with the python there was almost no "sludge" or rotted food in the gravel. Could this mean not enough food for the fish? And, I probably shouldn't get into the substrate to avoid screwing up the bacteria even more????? 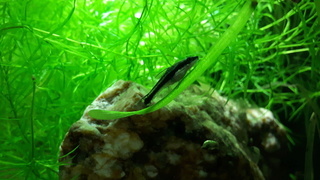 When we moved our black skirt tetras from the 10g to the 55g (back when we were clueless about the needs of these guys! 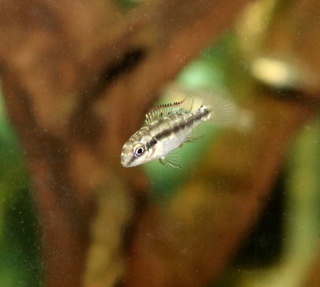 ), we had a 'mini cycle' despite moving filter media over. We did frequent water changes while this happened, and all worked out in the end, though it took a long time (i.e. a lot of water changes, testing, and waiting). We also tested our well water from the tap (after going through the softener), as well as straight from the well, just to be sure there wasn't an issue with our water. Because we had a low bioload (i.e. not many tetras in the tank), it took awhile to get this tank "fully cycled," but it was worth the effort and time, and the fish never experienced a high "spike" in anything (i.e. ammonia, nitrites, nitrates). Keep up with the water changes - and it doesn't hurt to test the water from your tap, for peace of mind. You mentioned concerns regarding feeding - what is your feeding regime? I'm feeding them once a day, enough so it is all gone in about 4 or 5 minutes. Either tetra color flakes OR crisps. There is none sitting around in the tank after 5minutes. Tap water tests at exactly the same as the tank water, except for the nitrites and nitrates...obviously, zero. GH is 300ppm, KH is 120, PH is 7. Except for the minerals, not too bad. My "real" test kit for GH and KH will be here tomorrow so I can see how that really is, but the strip tests have been consistant anyway. My other tanks look good, I have LED lights so they sparkle like sunlight and are crystal clear but this particular tank looks especially clear and sparkly. Now I am deciding if I am going to pull out the python for one tank change or just go with the buckets.... buckets are winning since I have nine little dogs running around waiting to help me. 50 feet of plastic tubing would look like a giant bone to them, I'm afraid!!! I will let others chime in here, but I do not follow the directions on most food containers...if I fed them as much as they could eat in in five minutes, I would think that their bellies would be far too full - I imagine their stomaches are only the size of their eyes....not too big! I've never understood why the instructions on those food containers advise this...with the betta pellets, they say to feed as much as they will eat in 2 minutes. In watching our betta eat, that would add up to about 20-25 pellets in one sitting - seems like a little too much! Our betta really does "inhale" food!! Feeding DOES drive me CRAZY... I force myself to skip one day each week. But, that said, I always thought (and, sadly, found to be true in a few cases) that over feeding could make instant cloudy water?? I will try to avoid their beady eyes staring at me and will feed them a bit less, maybe three minutes instead??? 10 gallons changed, a very slight drop in both nitrites and nitrates, and a WET FLOOR...should have used the python! I own a boarding kennel, we boarded a Betta once. Owner's instructions were "ONLY 8 pellets ONCE a day!!" That little guy did great and we boarded him frequently over the next FIVE years until they moved out of the area. I only feed my fish once every few days. With the exception of the goldfish which I feed twice a day. Even then, close to only a minute's worth for my community tanks. What is the ppm that the Nitrites and Nitrates are reading? I am using those five in one strips so it's not really easy to tell, but right now the nitrites are down to about 8 to 10, after two 50% water changes. Nitrites were originally off the end of the test strip on the high side. Nitrates are between 20 and 30, down from 40 yesterday. My API test kit won't be here until Monday. I also ordered some Seacham Prime but won't use it unless I really need to. It will be here tomorrow. I feed my goldfish and Koi twice a day, too! The malachite green killed your biological filter. A thorough gravel vac should be done with each water change. Substrate holds nothing of any value for regaining your cycle.Your beneficial bacteria is cultivated and lives in your filter bio media Test strips are indeed useless imo. The API kit will give you a good indicator of how things are progressing. I really doubt you have 8-10 nitrite and 20-40 nitrate. This is where the test strips are faultering. Prime binds ammonia into ammonium, neutralizes it for up to 48hrs. Dose for the entire tank volume, not just new water.Monitor water with the API kit, continue large water changes, daily if necessary until you reach the magic 0 ammonia and nitrite. when nitrate hits 20, do a 50% w/c. 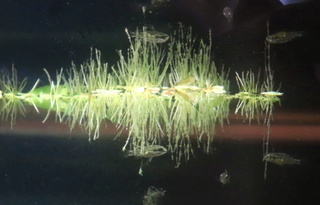 You do however need to see .25 of ammonia and nitrite early in a cycle, as traces of each are needed to grow nitrobacter, the bacteria that turns nitrite to nitrate. I would also suggest rehoming the plecs. Tank is not big enough for 1 let alone 2, and they are a huge strain on the bio-load of any size tank. Some can exceed 2ft in a couple years. Also, as a quick boost in bacteria population, you can take a cycled sponge or media from another tank and squeeze the sponge gunk into this tank. It will help restore bacteria populations quickly. I stuck an extra sponge in the filter of the other tank with great numbers, was hoping that would help. How long should I leave it to be seeded??? Plecos are tiny right now, under 5cm. I plan to move them into the 55 when the Koi go out for the Summer. Haha we're all against your plecos! I told her to get rid of them too. Thanks, I LOVE my plecos!!!! 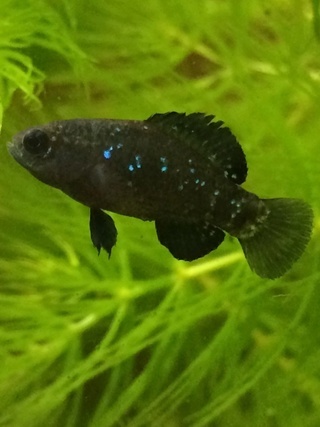 Back in the 70's when I kept the angels I had ONLY Angels and two large plecos. They were GREAT. Of course, no one tested tanks ever so they might not have been so great but those angels certainly did plenty of breeding. I sold the babies and they helped pay my expenses at college. Krista, those tanks had creeping jenny from my garden (don't know the scientific name) and some millfoil from a local pond. Probably that helped the balance?? Plants are they best, you know I've been super sick lately and my tanks are going on two weeks without a water change. I only feel I can let that happen because of the live plants helping me out. Well, my GH and KH test kit came today. It tests at about 100 for KH and 150 for GH, which is a bit softer than I had previously thought from the strip tests. These API drop tests are MUCH easier to read!!! I used my last strip to test for nitrites and nitrates tonight and nitrites are still way high, 10 ppm or maybe even higher, test strip is difficult to read. Nitrates are hanging around 20 ppm. I also added 3ml of Prime to the tank and will be getting some plants tomorrow, hopefully without snails!!! I will do another 40% water change tonight and hope for the best. I can double the Prime, but really would like this tank to fix itself without using too much of that stuff. Fish continue to look great and act great, which makes it hard for me to get too worried. If you go to the plant section there's a sticky on how to de-snail plants. Thanks, I do not want a tankful of snails!!! I promise I will not buy any more fish, Krista!! Back from shopping... the LFS only had some frogbit, I think it is? Like that duck weed but a bit bigger. He was worried about my LED's and not getting enough light for most plants. I do have a window, currently blacked out, behind that tank but he felt that might add other issues that I don't want to get into. I got some of that frogbit stuff. He tested my water from that tank and his results were pretty much the same as my strips. He was very perplexed and didn't have any other great ideas. He agrees, there is definitely not an over stocking issue, said he'd have to chalk it up to a messed up cycle from the malachite green and formalin, even with just the two doses. I did squeeze the sponges from two other tanks into that one today. Sooo frustrating because the tank looks super! Don't tell Krista, but I am currently inquiring about a 55 gallon with everything I found on our local Craigslist. Of course, I would need to find somewhere to put it!!!! And, then... stock it!!! IF I get it, you guys are going to have to help me set it up RIGHT the first time, please??? Do you just have the LEDs or do you have a hood with a bulb too? I just have hoods with bulbs and I have some nice plants, Java Fern is super easy to grow. These are the complete set up, (read cheap) tanks from walmart and the leds are built into the hood. I added blue ones on one side of each tank. They are bright enough to grow algae! I run the whites and blues for about 12 hours, run the blues all night cuz they are so pretty! I do have access to a hood with the tube lights. I could easily switch the LEDS out with the hooded one in the kennel housing the baby koi... not trying to grow anything there cuz they uproot everything! As for the cycle, I love prime, and it can do wonders for the detoxification of ammonia and nitrite (and dechlorinator), it's bogus on the nitrate claims. Prime is good for the short term, but frequent and large water changes are the best ways of reestablishing your full cycle. Exciting about the new tank. Did you end up getting it? I realized I really needed to pay some bills before I indulge again, so I made an appointment with the guy to go see it NEXT weekend. We have school vacation here this week and with a full boarding kennel that should help me get some extra cash. Hopefully someone else won't jump on it. I used the Prime, but can't test today as I ran out of strips. API kit should be here tomorrow. Even if you use prime, you'll still test for ammonia. It just converts the ammonia to ammonium. The test does not distinguish between them. It is less toxic though. Hope to hear about the tank next week.